Work to prevent rock slips along part of the main coastal railway in Devon is on schedule to finish next year, according to Network Rail. 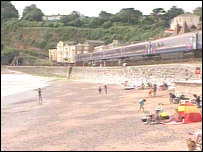 The company has already spent more than £6m on the first three phases of the project to stabilise the line between Teignmouth and Dawlish Warren. The next phase of work to install protective netting along the cliffside will cost £2.8 million. Contractors say the work is set to finish on target in April 2005. In March when netting work began, some residents branded the black nets on the red cliffs as an "eyesore". But Andy Jenkins, Network Rail's project manager, says the company is extremely pleased with the progress, saying the co-operation and support from local residents and land owners has been crucial to the project. Mr Jenkins said: "The netting works have attracted a lot of interest from people walking along the sea wall. "Everyone is pleased to see that, where meshing has already been installed, the vegetation is already growing through." The company says it will continue to monitor the sea cliffs for signs of movement, but it is confident it can reduced the potential impact on train services over the winter period. Over the summer there was only one significant rock skip recorded.